I modify the kit for different outings. When we're going out to the park, zoo, or someplace we're going to be outside, I throw in sunscreen. 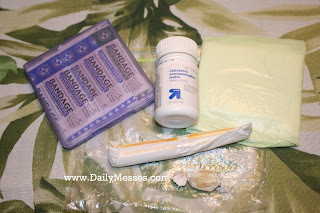 If we're flying, I use antiseptic wipes. If we're staying on the ground, I use Neosporin To Go Spray. I also throw in a hand sanitizer. It all fits inside a sandwich sized Ziploc bag. I had an old 3 1/2" floppy disk case that for some reason never got thrown out. It found a new home as my first aide kit. (Note: For the younger moms reading this: immediately after we stopped chiseling on stone tablets, we used "floppy drives" to store our important data. Prior to USB drives, we used CD's. Prior to CD's we used Zip drives and before Zip drives we used 3 1/2" floppy disks. You may be able to find these in museums or antique stores.) 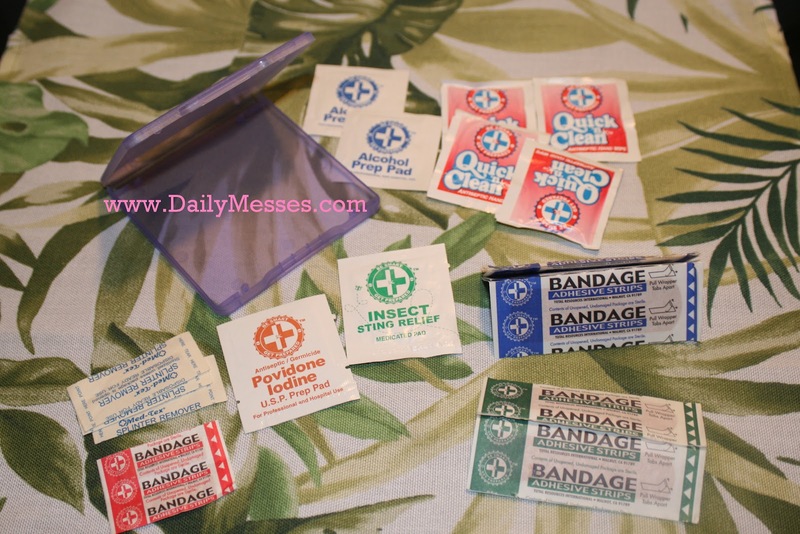 I included 1 iodine packet, 1 insect sting relish wipe, 4 Quick Clean antiseptic wipes, 2 alcohol wipes, 3 splinter removers, and a bunch of different sized band-aides. This is all in the small case! 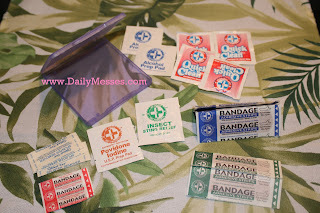 You probably don't need most of what's in mine, but you definitely want to have different sized band-aides and some type of antiseptic. Next, I add in children's pain reliever. During cold season, I usually throw in a couple cough drops. 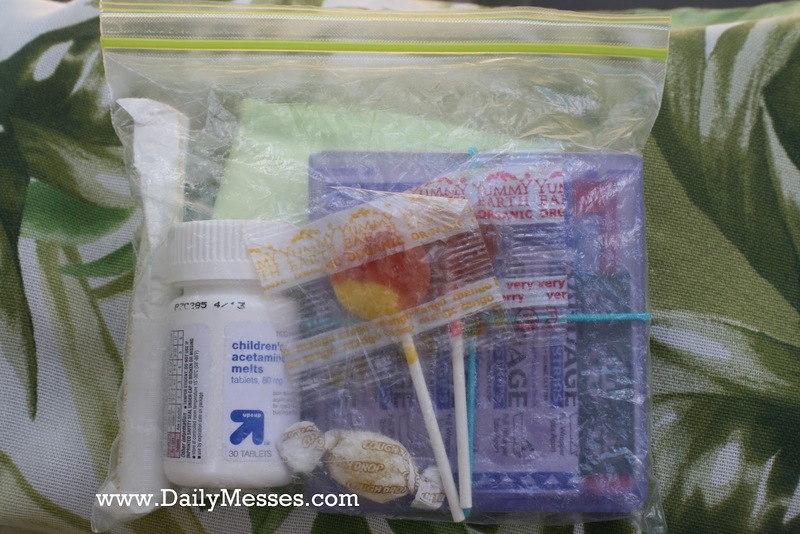 When the kids are at Grandma's or a babysitter's, I drop the diaper bag (complete with first aide kit) off with them. I keep the adult pain reliever in my purse, not in the diaper bag's first aide kit, because I don't want any mix ups (not so worried about the Grandmas, more about the babysitters). I also add in the cure-all for boo-boos: suckers/lollipops!